A major reason that people stay in hostels instead of hotels is the chance to meet other travelers. A good hang-out area or bar that's conducive to socializing turns a hostel from okay to great. It's much easier to strike up a conversation while playing pool or sipping a drink on a couch than while climbing in and out of your bunk. The Sunset Bar at Garden Village in Siem Reap was one of the best I've seen so far. Bartenders can make the difference between a sleepy bar where you have a beer before moving on and a hostel-wide dance party. A friendly bartender can make new arrivals feel welcome and keep guests staying in the bar longer. The benefit is not just for the backpackers here - people buying more drinks means more money for the hostel owner. 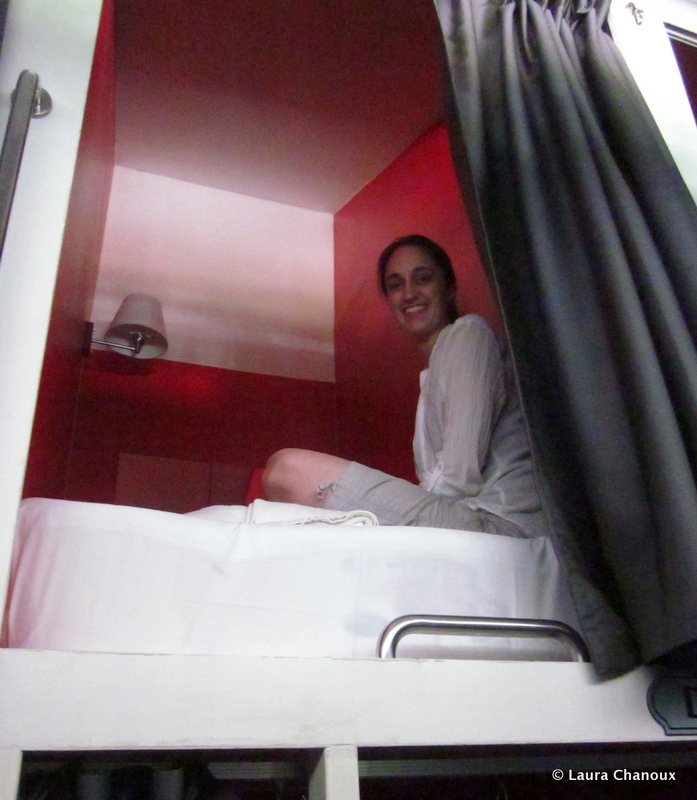 Another big reason people stay in hostels and guesthouses is to keep costs down. Even if your room only costs $10 a night, it is still frustrating to feel like the management is trying to get every penny they can out of you. I've run into several hostels that sell bottled water for double the price of the market down the street. One sold soda for three times fair price. While it's necessary for hostels to mark up drinks or other supplies for resale, those prices left me feeling like a walking ATM. 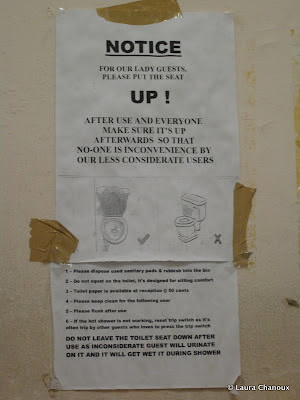 From a hostel in Kuala Lumpur where we happily were not staying. especially since toilet paper was only available from the front desk for 50 cents. Aside from prices, I've been in several hotels and hostels that ration basic supplies. 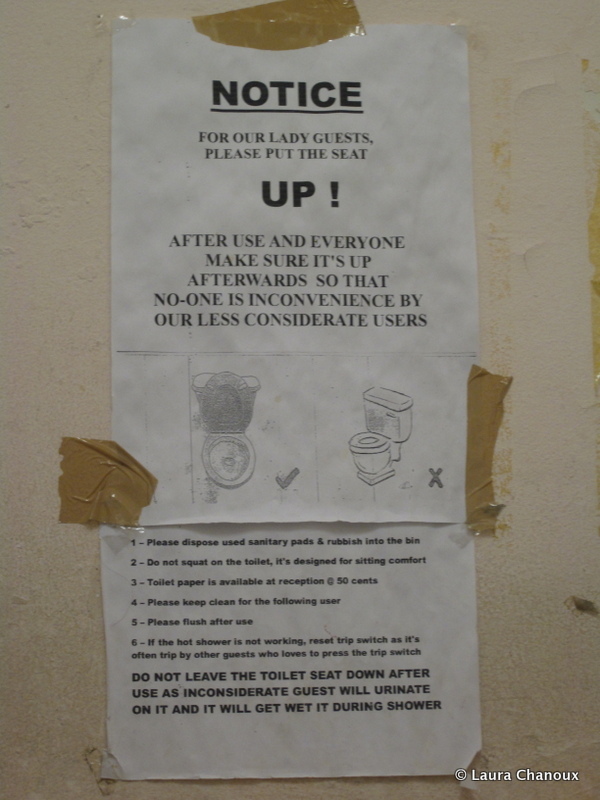 In Malaysia, we stayed in a hostel with a shared bathroom that had one industrial-sized roll of toilet paper outside the stalls with a sign asking guests not to use too much. Every night the toilet paper would run out by midnight and wouldn't be refilled until the front desk opened the next morning. We started hoarding it in our room. When Eric brought up the problem with the receptionist and suggested they put a new roll out when they closed at ten, she explained, "Oh, people go to the bar and then they use it up during the night, so we don't do that." Aside from the occasional TPed tree in teen movies, most people use toilet paper because they need it. I recognize that toilet paper is more of a western necessity, but it's still nice not to have to worry about your supply when you're staying at a guesthouse that caters to westerners. The best dorms I've stayed in so far have acknowledged that people don't sleep in sixteen-person rooms because they want to show off their pajamas. Even simple things like curtains between beds makes a big difference. On the subject of dorm rooms, try to have solid bunk beds. My worst dorm experience was in Rome. All I remember are shaky metal bunks and the fear that I was waking up the guy below me every time I rolled over. I've learned to travel with a towel because many places don't have them. The ones that do are wonderful - then you can shower on the day you check out without having to shove a wet towel into your backpack. Recently Eric and I stayed in a hostel that was pretty and airy. The dorm was a big wooden room with windows that looked out over the courtyard and beds covered by wafting mosquito nets. During the night I discovered that the mosquito net was more decorative than useful; with multiple openings, the two clothespins provided could not keep the holes closed and the mosquitoes out. Even though in other respects it was a great hostel, Eric and I checked out earlier than we would have because we couldn't stand the bug bites. While it may have been expensive to buy a dozen new mosquito nets, there are cheaper options. We picked up an S.C. Johnson product called Bay-Gon, which plugs into an outlet and wards off mosquitoes for the night. With a few of those positioned throughout the dorm, the bugs might not have been a huge problem. Some of the details we've seen and liked: each bed in one dorm had its own lamp and electrical outlet; one hostel had big comfy armchairs on the landings, which were great places to read; one provided free hot water for tea; others provided hot breakfasts with eggs and pancakes instead of just cereal and toast. If you're going to serve food, make sure it's good food. If you're going to offer wifi, make sure it can handle a large number of guests online at once. If you have a bar, do your best to make it a fun place to hang out. We stayed in a guest house with a nice bar where they had a bonfire every night, but last call was at 11:00 so that the bartender could go home. It had the potential to be great, but fell short. 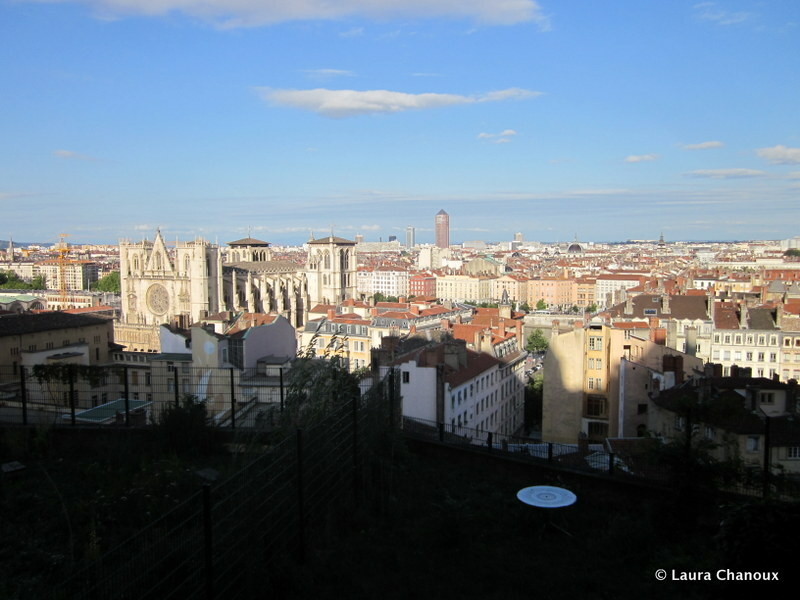 When Eric and I visited Lyon, France, we stayed in a hostel perched on a hilltop that overlooked the city. The view was beautiful, but the hostel itself was filled with cement walls and generic furniture. In such a gorgeous location, it would have been a more memorable stay if the hostel had tried to match the surrounding area in some way. Lyon is too beautiful a city to have generic hostels. 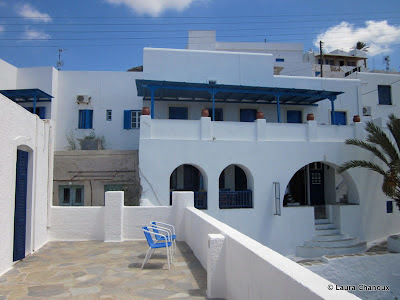 By contrast, the hostel we've stayed in on the island Ios in Greece is not especially fancy. 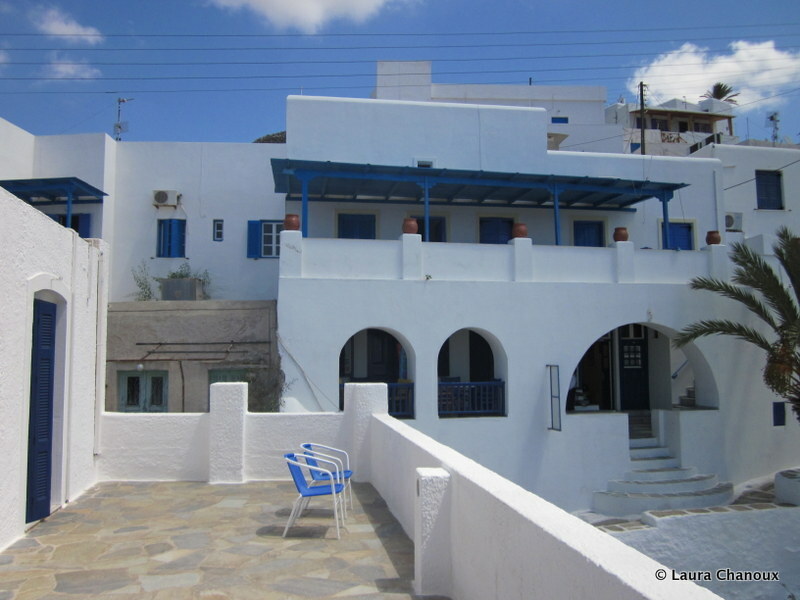 Its whitewashed walls match the look of many Greek island towns. The restaurant/bar area faces the sunset every night and many of the rooms come with balconies and simple chairs to relax and look out over the Mediterranean. The hostel stands out not because its owners paid attention to minute details in the decor, but because it is simple, beautiful, and works with its location. 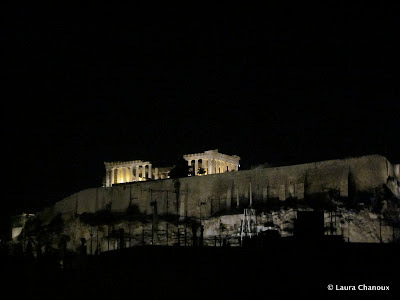 It feels Greek, whereas the hostel in Lyon felt like it could have been dropped in any city in the world. They didn't have to spend a lot to make the hostel distinctive and beautiful. The best hostels are ones where the staff feel like friends within a few days. 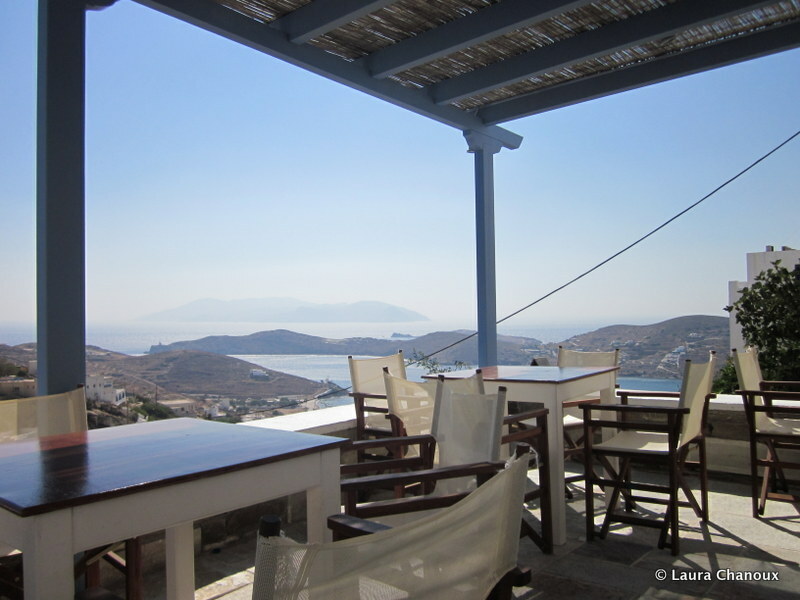 When the staff seem happy to be in the hostel, guests almost automatically feel more welcome. Eric pointed out to me that this is why many hostels hire backpackers to work as receptionists or bartenders. I've stayed at a few places where I felt like an inconvenience to the front desk clerks, even when I interrupted them to pay my bill. I was happy to leave, whereas in other hostels saying goodbye to the receptionists at the end of the stay felt like more like a parting of friends. I didn't realize how important windows are to me until we stayed in a windowless room in Phnom Penh for two days. It's nice to know when it's daylight outside. I've been impressed by the variety of accommodation we have found as we've traveled. 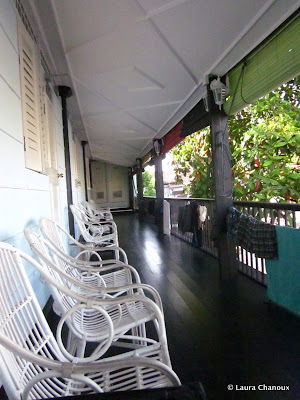 There have been some hostels I would love to go back to for a long time and others I was happy to leave behind. As we keep going, I'm looking forward to seeing where else we end up each night! What are your requirements for a good hotel or hostel? What were your best or worst hotel experiences?